I’m a bit of a latecomer to the Toms party but then I’m not an environmental activist and I don’t live on the West coast. So I had to wait until the TED Global goodie bag to come across this brand of ethically driven footwear and mighty fine they are too. Toms was founded three years ago by Blake Mycoskie following a trip to Agentina. Blake was struck by number of children that did not have shoes in the region he was visiting and the health problems that resulted from kids having nothing to protect their feet. One of the leading causes of disease in developing countries is soil transmitted parasites which penetrate the foot through open sores. In addition in many communities wearing a pair of shoes is a condition of being able to attend school. While many brands and many of the dynamic micro brands that count Adliterate as a fan, have an ethical dimension, the whole premise of Toms was to provide a solution to looking after the feet of kids growing up in endemic poverty. For every pair of shoes they sell they give another pair to a child that needs one. Indeed in the last three years they have distributed 140,000 pairs of shoes in the Argentina, South Africa and the USA (most recently in New Orleans where the issues are somewhat different to developing countries). 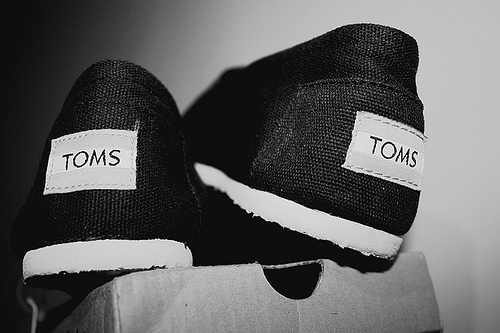 In 2009 they plan to distribute 300,000 pairs of Toms reflecting the growth and success of the brand. We have often talked about the key ingredients of Dynamic Micro Brands (hell you could even call them Little Lovemarks if you liked). That they drip with authenticity, having a powerful and understood reason to exist. That product performance is paramount, leading advocates to believe the product to be functionally superior to their competition. And that they often have a clearly articulated idea at their heart that drives both the business and brand. Seems to me that Toms over indexes suitably on all three criteria. Shoes are distributed on shoe drop visits by Toms’ people and volunteers and so impressed by the shoes and moved by the story that’s what I am going to help do between the 5th and 12th of December in Argentina. If you would like to help me you can donate towards my $1,800 target at here. Previous postIs it the end of the line for the digital agency? Next postWho is to blame? Tom’s has a great business model and they do a great thing. There story is a great way to build a brand. It seems that they aren’t even trying to build a brand or make money they just want to help those less fortunate. They have done a excellent job. Good luck with your donation of time, I’m sure that you will enjoy it and be blessed by seeing all these young children get gifts that we take for granted here in the states.